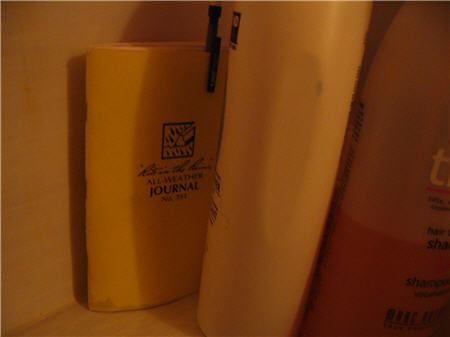 I have previously recommended Crayola Bathtub Crayons as a useful means of recording ideas in the shower. However, it can be quite hard to read, and on more than one occasion I have been unable to decipher what I have written. Plus it discolors the shower walls slightly. What a nice surprise, then, to find that my local art store carries Rite-In-The-Rain notebooks. These are water-resistant notebooks that are perfect for capturing ideas in the shower. You don't have to spend for a waterproof pen – pencil works fine. 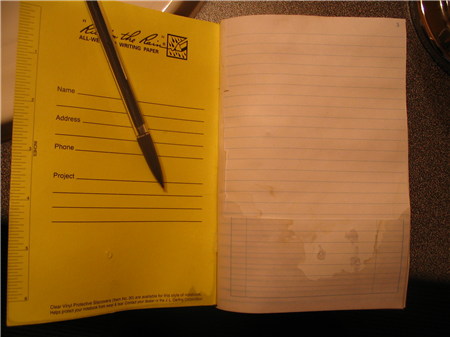 The pages aren't totally waterproof; if you really soak them, the coating wears away and the page goes transparent. So I recommend that you stick it behind a shampoo bottle. A Rite-In-The-Rain notebook will set you back $8. posted by Jonathan at 7/08/2007 01:28:00 a.m.
An ex-girlfriend of mine was a Canadian Reservist and would bring home army-surplus waterproof notebooks. Army-green plastic covers with waxed paper pages of some sort. Use with pencil. I took advantage of them as a newspaper reporter. By Jeff Werner, at 7/12/2007 7:58 a.m.
By Jonathan, at 7/12/2007 10:30 a.m.